Entertaining during the holidays sure is fun. 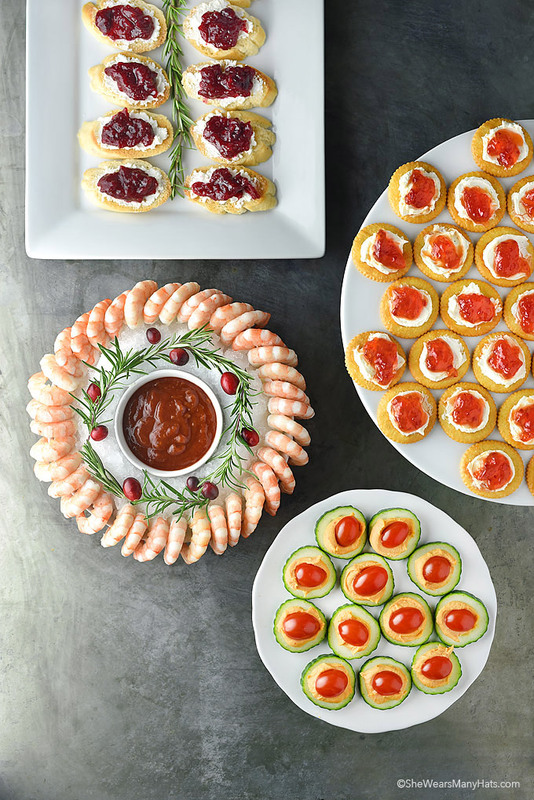 With a few ideas for Easy Holiday Appetizers it doesn’t have to be complicated or expensive. With such big, involved meals throughout the holidays, sometimes it’s nice to keep it simple with the appetizers. If you’re hosting any holidays gatherings, I know you’ll be running out of space in your oven and fridge before the guests have even arrived. Not to mention, running out of time. That’s why I love some Easy Holiday Appetizers. 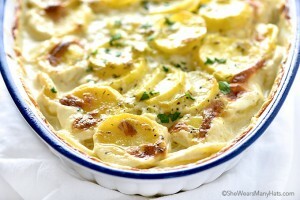 You can easily put them together and know that your guests will love it, without having to break your back or the bank. 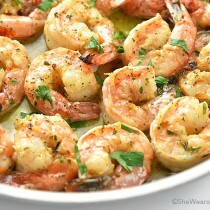 Today I’m sharing four super easy appetizers perfect for holiday entertaining. All ingredients can be stocked and ready for any last-minute gatherings. Speaking of being stocked and ready, our local Walmart certainly makes life a bit easier during the rush of the holidays. I’m able to find all my entertaining needs including fresh fruits and vegetables and an array of charcuterie items, as well as table top decor and serving pieces all in one place. 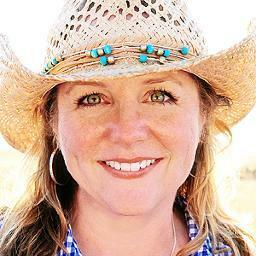 And did you know that Walmart also provides a service to place your grocery order online? Yep. Place your order online and Walmart will send you an email when it’s ready to be picked up, usually within a few hours. Anything that helps simplify the frantic pace that accompanies the holiday season is fine by me. One easy option is an elegant Shrimp Ring. You can find them pre-cooked with cocktail sauce in the frozen foods section at Walmart. 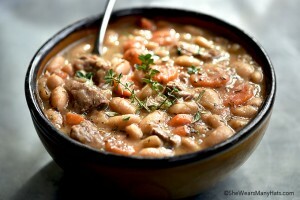 They take about 15-20 minutes to thaw and are easy to arrange for serving. Here I used a simple white bowl that I filled with crushed ice. I then put a smaller bowl in the center for the cocktail sauce. 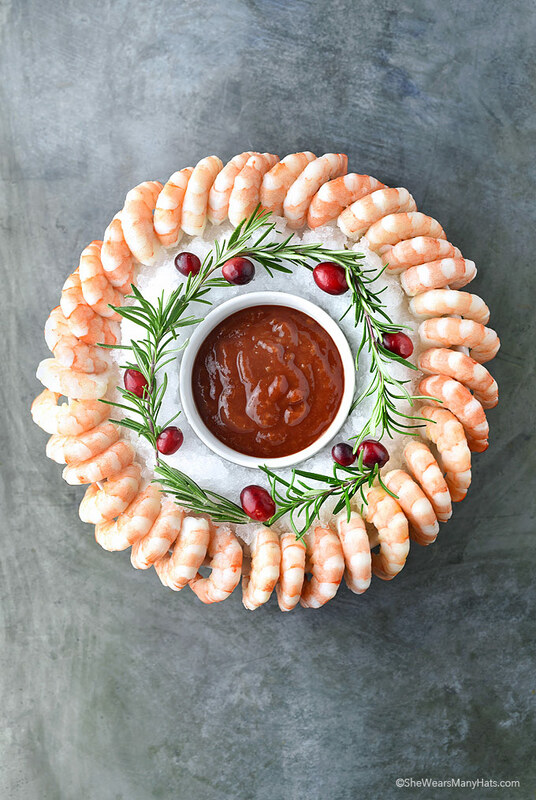 The shrimp were placed around the rim and a garnish of cranberries and fresh rosemary sprigs were added for a bit of holiday flair. Once thawed, it only takes about 10 minutes to assemble and you’re done. It can be kept refrigerated until party time. So easy and so pretty! 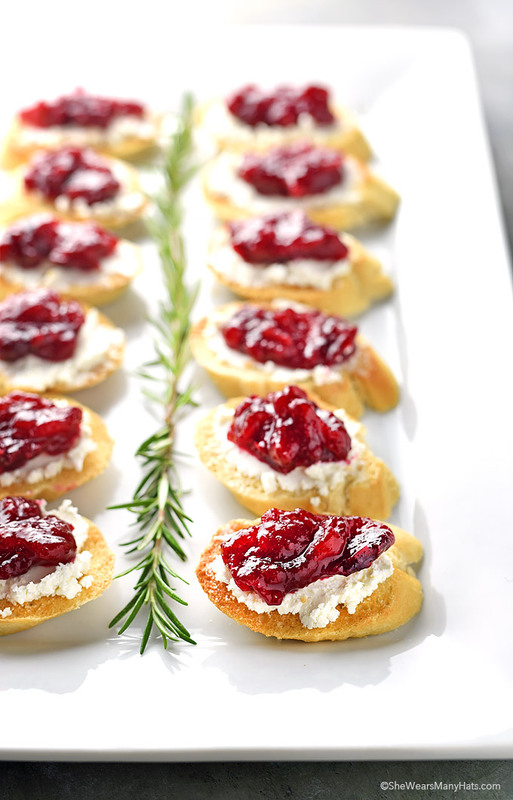 Next is one of my favorites: Cranberry Goat Cheese Crostini, an excellent appetizer option. Inspired by summery Peach and Goat Cheese Bruschetta, these festive crostini are delicious. Cranberry sauce or preserves makes this perfect for the holiday season. These require just 3 simple ingredients: a baguette, goat cheese and cranberry sauce. Slice the baguette. 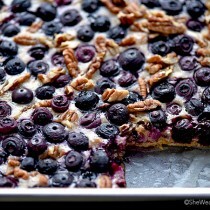 Spread slices on a large baking sheet and lightly toast in the oven. Spread a bit of goat cheese and top with cranberry sauce. That’s it! Raspberry or cranberry preserves may also be used in place of cranberry sauce. Other spreadable cheeses may be used instead of goat cheese. 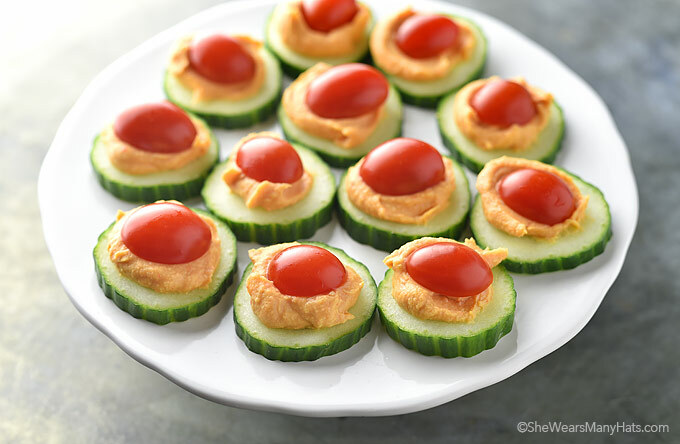 For a nice fresh bite, try Cucumber Tomato Red Pepper Hummus Bites. These are a yummy way to add in some veggies, plus, they’re so darn cute. Also, this is a great way to serve hummus at a party, because you don’t have to worry about a crowd forming around the bowl, or those sneaky double dippers. Slice cucumber, add a dollop of hummus and top with half of a grape tomato. Quick and easy! 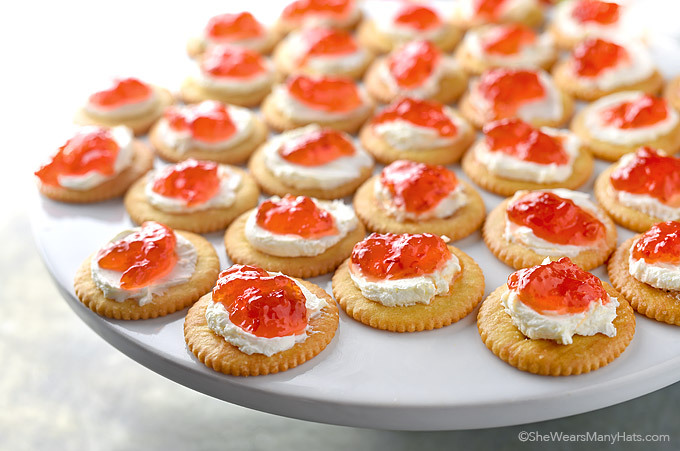 Another finger food inspired by one of my holiday favorites is this Cream Cheese and Pepper Jelly Crackers. I love pepper jelly with cream cheese, and with a Ritz cracker as the foundation, this appetizer couldn’t be any easier, or more wallet friendly! I also like to serve this combo as a festive holiday spread. For parties, it’s fun to make individual servings. It’s convenient and user-friendly too. 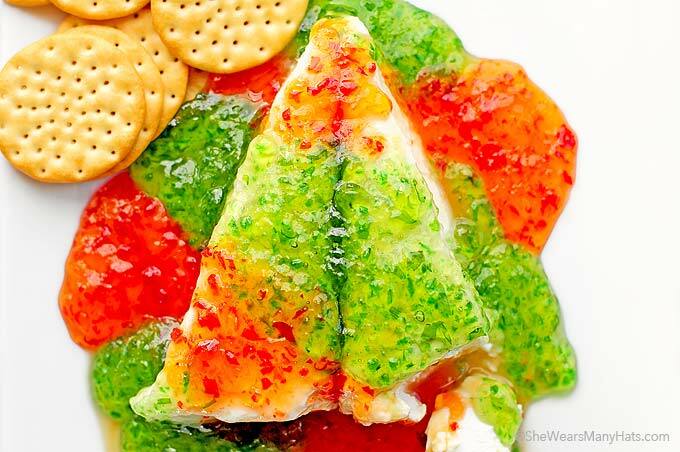 Spread cream cheese on top of a Ritz Cracker, top with a little bit of red (or green) pepper jelly for one oh so delicious bite. 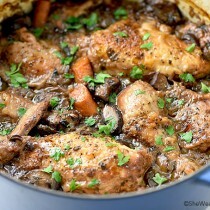 The recipes look delicious! 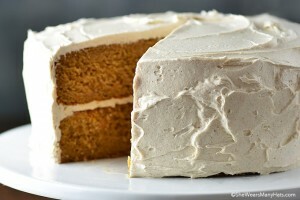 I will be making some of these soon. Wondering….how, where can I get shaved rice like you put in the shrimp ring? I used a blender to crush it. I’m not sure where you can purchase shaved ice.